The Ebac BD80 Dehumidifier is a heavy duty unit ideal for use in restoration work and other tough jobs in industrial, commercial and residential settings. This unit is ruggedly constructed to withstand extreme conditions and to provide dependable performance where and when it is most needed. Suitable for one man operation this dehumidifier is economical to operate and, with its continuous drain facility, can be left unattended where necessary. The Ebac BD80 is a compact dehumidifier with external dimensions of only 17 x 26 x 34 inches. This makes it suitable for operation in areas where space is limited and for manoeuvring around obstacles. Although the BD80 weighs around 100lb the provision of rugged wheels at the rear and an integral handle make it suitable for one man operation once on site. The unit is small enough for carriage by even the smallest commercial vehicle making the unit easy to deploy from one location to the next. The Ebac BD80 is a powerful dehumidifier with a water extraction capacity of 56 pints per day at 80°F and 60% relative humidity. At saturation, a condition more likely to be found in the context of restoration, this rate increases to 15 gallons per day. This is sufficient, according to the manufacturer, for areas of up to 1500 sq ft making this unit versatile enough to be used in a wide variety of situations. The ED80 is engineered and built for demanding jobs with a high efficiency rotary compressor and other industrial grade components. It is encased in a heavy duty steel chassis which has an epoxy coating for added durability. The unit is mounted on a wheeled carriage, of which the handle is an integral part, not only to aid mobility but to provide all round protection for the dehumidifier from accidental impact damage. A unit built for restoration and other extreme environments must have a capacity for low temperature operation. The Ebac BD80 incorporates Ebac's own hot gas defrost system which ensures effective operation at temperatures as low as 33°F. 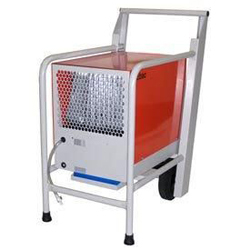 It is this feature, together with the durability of this unit, that has attracted sales from individuals who have turned to this dehumidifier for service in a cold basement area when other units have not been up to the job. Time is money and the ED80 can operate 24/7 due to its continuous drainage feature. The ED80 is equipped with a gravity feed for continuous drainage but if this is insufficiently versatile for a user's needs an otherwise identical model, the ED80-XE, is available equipped with an integral condensate pump. The pump is a powerful unit and will raise water up to 20 feet or transfer it 100 feet horizontally. This feature allows the unit to operate continuously with or without an operator present. The ED80-XE also incorporates a pump purge feature which allows the condensate pump to be drained before transfer to another site and prevents water spillage during transport. Although designed for the restoration industry and industrial and commercial users, the Ebac ED80 will appeal to a number of private buyers who have an area with particularly demanding conditions for dehumidifiers. Dehumidifying cold, wet basements and garages are among the applications this unit is well suited for but in any home where extreme conditions exist this unit could be the best choice. It is, of course, much more costly than a room dehumidifier as it is the quality of its components that makes it so much more durable and effective.